Thank You Notes, Letters of Appreciation, and Testimonials! At The Cloth Castle we strive to make every visit an enjoyable one. We have been here with you and your family through all of your milestones; as you have been with our family. So we wanted to say thank you to you all. We would also love to hear of your experiences with us. If you have anything you would like to share, email me (Bryan) at theclothcastle@hotmail.com with your testimonial and I would be glad to post it online! I am the very fortunate winner of your generously donated Husqvarna Sewing Machine at the Victoria Quilters Guild Show. I am thrilled with it! Thank you for your continued support of our guild not only for providing amazing prizes at our show , but also for the monthly donations to our meetings! This Post is a true joy to write.... Vancouver Islanders, especially you in Victoria, take notes! and for all you others, this is a story to remember both as a business owner and a consumer. The move to our new studio space also brought up the need for some faster and more modern machinery, especially in the Serger department. But living in a smallish city on Vancouver Island, there are no stores here that sell sergers... hmmm so being an ex-Victorian I call the place most Victorians call first for sewing machines. First, I need to purchase 3 new machines and I need to have them shipped to me... so can you do this? No, we are "not allowed" to take orders over the phone or to ship. Really??? Furthermore she explains that the store took a hit on someone ordering machines with a credit card.... hmmm isn't that why the credit card companies have authorization numbers??? So, I am not pleased as taking the time to drive down to Victoria just consumes time, that quite frankly I don't have right now. But, while I have her on the phone, I ask her to quote me some recommended models and the prices for same. She did listen to what I wanted... but I don't think she heard me at all... bottom line was I needed faster machines that were "heavy duty" but not industrial... and what I got back from her was an immediate quote on 2 very high end machines that use air to thread... no doubt lovely machines but not anything to do with what I needed and the coverstitch would have to be specially ordered. And she tried to talk me out of the coverstitch machine!!! Good grief. Odd she didn't realize that in running a design studio, that specializes in sewn products that I probably had a pretty good idea of what was out there, just not the specifics on what they carried. Hmmm, no shipping, no phone order and the highest quote on inappropriate machines.... time to move on. I need a serger and a coverstitch machine. Both need to be fast and can handle heavy duty use. Again without hesitation he directed me to their website, recommended 2 machines for me to look at and then gave me the prices for both... extra joy to me, and completely unlooked for, both were on Sale! I looked at both, was very impressed. Called him back, asked a couple of questions and the deal was sealed. Problem solved!! Friday arrives and in the pm so do my machines... Yahoo! I immediately open the boxes and take out the instruction booklets before doing anything else. Oh no... one of the machines is the wrong machine in the right box.... oh bummer. So on to the phone I go, knowing that Barry is up Island but wanting to leave a message at the store for when he arrives. So, when I phone the store I get Brian.... I explain the problem and he is so nicely understanding and then asks if he can put me on hold. Unknown to me, he has called Barry, explained the problem. Brian has both of us on the phone, and assures me that a) Barry is not happy that this mix-up has occurred, b) the right machine is in the store, that the factory has made this boo-boo but unfortunately Barry won't be going back up Island for a couple of weeks, and c) but will come and pick-up the machine I have on his way back. While we are having this discussion, I can hear I voice in the background to where Brian is... he then relays to me that Vandy (an obsiously lovely woman who works there :) is going up Island on Tuesday and could drop off the new right machine then!! Problem solved!! She did. A delightful woman.... and her husband even offered to take the machine upstairs for me! Both my machines are perfect and perfectly suited to what I need. I have to tell you all that this experience and my interactions with all these wonderful Cloth Castle people made my day, my week, my month!! Sure it is unfortunate that the one machine wasn't the one I wanted but it is always, always, always what is done with the problems (no avoiding 100% them, they do happen) that sets one company miles above any other. As far as I am concerned, these people are quite simply THE BEST and I thank each and everyone of them for this incredible customer service. I really, really do. Barry took my most favourite old machine, that has been stuck in reverse forever and is truly optimistic on being able to breath life back into it. I am so attached to this machine that it has come with me everywhere and when I was in Calgary I wanted to get it fixed (as it stalled while I was there) and seriously the one place just wanted me to buy a new one, a cheap new one, for about the price of the repair... and I am sorry but a cheap sewing machine wasn't going to replace the Husky that is as solid as a rock and extremely well made. They didn't even attempt to get my machine repair business. The second place I took it to, would look at the machine, and call me with an estimate... at least it was in the repair shop! Alas, the repair man was nice, saying really the machine just needed a good cleaning, no new parts, but that it would take him.... 4-5 hours at a rate that you associate with getting your car repaired.... and would I like to consider buying a new one. Barry's response was, oh ya, I know the machine you are talking about and repairing sewing machines is what we do!.... sigh. I definitely feel my old and dear machine is in good hands and if anyone can repair it, it will be them and that I will have a good running working machine returned to me. Love, love it. If for some reason, which I sincerely doubt, that it cannot be enlivened, I will know absolutely that everything that could be done, has been. Did I say that I am really, really attached to this marvelous Husky??? I hope you enjoyed this story as much as I enjoyed telling it :) excellent stuff, eh? Sigh, it is my sadness to have to report that I DID indeed receive that dreaded service call. Barry was very kind as he imparted the news that there was absolutely no hope for the dear old Husky... that he had spent hours trying to revive her, but to no avail. He did offer to drop off the "carcass" by which I am sure he meant the final remains of the recently deceased... really, I am sure he did! But I WAS BRAVE, took a deep breath, and said no, that was very kind but really she should just go directly to the great sewing machine heaven in the sky (or words to that effect!) Barry then, again so kindly told me he would plunder the remains before he threw it (her) in the dumpster, which I am sure he meant that he would harvest the parts to help give new life to other old Huskys who could be revived with a much needed transplant.... really, I am sure he did! So I thanked him very much for trying so hard with dear sweet Husky and hung up the phone... sigh. 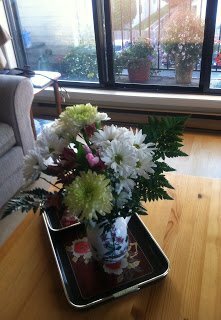 He is turned away from me when I get off the elevator and when he turns around he does NOT have a machine in his hands but a lovely bouquet of flowers!!!! He so very formally presents them to me as my condolence bouquet of flowers!!!!! in memory of the dearly departed! I cannot begin to tell you how hard I laughed. OMG never in a hundred years could I have seen this one coming! It really was the most perfect humourous end to our fun conversation over what could not be done for my old machine. The man has a truly wonderful, and wicked sense of humour! Everyone in this world has been, or has a loved one effected by cancer. Our family here at the Cloth Castle is no exception, a few years ago our beloved Michelle passed away after her fight with cancer. And in memory of her life and of her love for quilting, the store donated a large amount of quilts to the Victoria Hospice Society at the Jubilee Hospital in her Honor. We hoped that these quilts would help give a small comfort to those who are using them. As we all know that being wrapped in a quilt is like being wrapped in a warm hug. 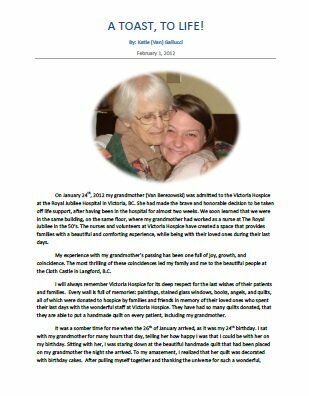 We were recently contact by a young woman and her family whose grandmother was currently receiving palliative care at the hospice and we wanted to share the letter she sent us, with you. Please take some time to read the letter and see maybe what you can do to help reach out and give a warm hug to some one out there.